Posted on January 7, 2012 by admin. This entry was posted in Uncategorized and tagged illustration, illustration friday. Bookmark the permalink. 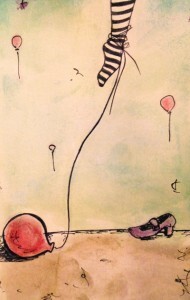 Love the concept and the whimsy,nice painting too! 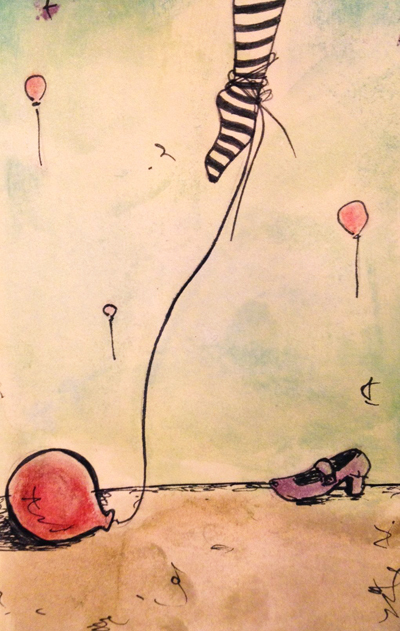 i love this concept & the whimsy, your colors against the black & white striped stockings. Wonderful illustration! The balloon may be grounded but the dancer is not! This is one of my favorite IF illustrations this week. Love its simplicity, its storytelling, its lines. Very surreal and dream-like. I really like your watercolor hues. Nice! I really like the composition. And the striped sock.